Here’s what’s happening in the world of television for Sunday, November 4. All times are Eastern. 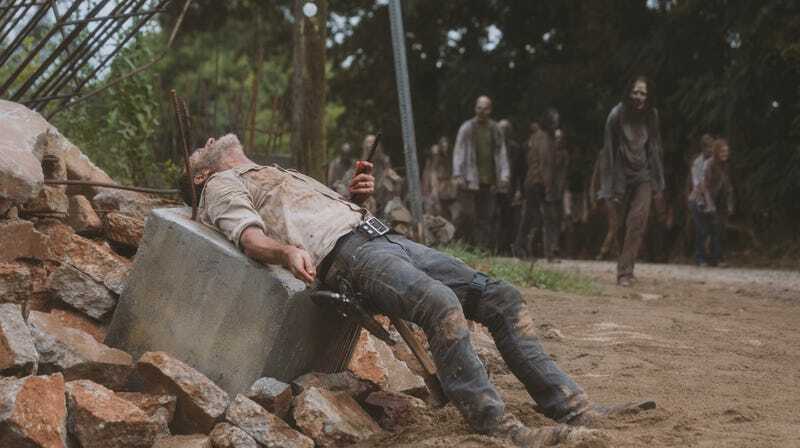 The Walking Dead (AMC, 9 p.m.): It’s a pretty safe bet that a lot of people will be watching tonight’s The Walking Dead. The AMC stalwart’s ratings have taken a significant tumble this year, but they’re on the rise, likely thanks in no small part to the impending exit of series star Andrew Lincoln. Well, Rick Grimes’ end is no longer nigh. It’s here, and we’d guess that some people who quit the show seasons back might tune in to see how he meets his end (after meeting that piece of rebar in the last episode, pictured above). Audiences returning to a show to say farewell to a beloved character isn’t an unusual thing. (Still miss you, George O’Malley.) Previously departed cast members returning for a more dramatic goodbye is only slightly less so. Based on the trailer, it appears that Rick’s due for some sort of hallucination, dream, flashback, or combination of the three, and showrunner Angela Kang confirmed that a few familiar faces from seasons past will be back, presumably somewhere in those trippy sequences. Whatever happens, Alex McLevy will shamble slowly but unceasingly toward you, fueled by a fervent hunger to share his recap. Last Week Tonight With John Oliver (HBO, 11:10 p.m.): Okay, this isn’t really all that wild of a card—it’s John Oliver, he’s good at his job, no surprises there—but it’s now officially the week of the mid-term elections. Whatever Oliver’s topic may be, it’s probably going to be relevant, so while he’s always a safe bet, this week that’s even more the case than usual. You can check to make sure you’re still on the voter rolls while you watch. Interactive fun! But hey, there’s a chance that you just can’t think about politics for one more second right now, because a person has to care about other things sometimes or they’ll go crazy, absolutely crazy, right? If that’s the case, if you need a break, then hey, that’s cool. Disney’s celebrating Mickey’s 90th Spectacular (ABC, 8 p.m.), if that’s your thing. The next episode of the endearing new series Amanda To The Rescue (Animal Planet, 9 p.m) is called “Blind Puppy Homecoming,” so that’s a whole situation. And if you’ve not yet had the pleasure, the first two seasons of One Day At A Time (Netflix) are just freakin’ wonderful. And you can still check your voter registration while you watch Mickey Mouse/blind puppies/Rita Moreno. Win-win.